Florida's offense is showing signs of life, and the Panthers are hoping that a game against Tampa Bay can help keep it going. The Panthers will be looking to take advantage of the league's worst defensive team on Saturday when they visit the Lightning. Florida (23-25-5) ranks among the worst offenses in the league with just 2.48 goals per game, but has managed at least three goals in six of its last eight games. Nathan Horton scored once in regulation and once in the shootout in Friday's 4-3 win over Vancouver, as the Panthers bounced back from Wednesday's 1-0 loss to Buffalo. Horton's goal at 5:04 of the second period was Florida's first since the third period against Edmonton on Jan. 24, a span of 97 minutes, 45 seconds. The victory came in Vancouver goalie Roberto Luongo's first trip back to South Florida since he was traded from the Panthers in 2006. "It was a big night," said Florida forward Stephen Weiss, who had a goal and an assist. "A good crowd and a lot of emotion in the building. It was a fun night. You could just sense we were going to have a big game." Horton ended his own scoring drought, finding the net for the first time since scoring two goals against the New York Islanders on Jan. 3. He has a good chance of staying hot on Saturday - in 24 career games against Tampa Bay, Horton has 14 goals, his most against any team. The rest of the Panthers' offense will also aim for a big game against the Lightning, who are allowing a league-high 3.35 goals per game. Tampa Bay has yielded a total of 18 goals in its last four games. The Lightning (21-26-5) are in last place in the Eastern Conference with 47 points, although they trail the first-place Carolina Hurricanes by only nine points in the weak Southeast Division. Their recent home games have been attended by scouts from opposing teams, anticipating that they will become sellers at the trade deadline. 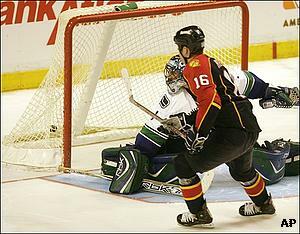 However, Tampa Bay has won four of its last six and is coming off Thursday's 4-3 win over Vancouver. Brad Richards had a goal and two assists for the Lightning, who won for just the second time in 17 games when trailing after the first period. Richards has 16 goals and 29 assists this season, but is a league-worst minus 26. He has three goals in his last four games, though, and had a pair of goals in his last game against Florida, a 5-3 win on Jan. 12. "He was great," defenseman Shane O'Brien said Thursday. "It's no secret he's got tons of talent, and when he competes like that, he's one of the best in the league." Florida's Olli Jokinen has three goals and five assists in five games against Tampa Bay this season. After missing the last two periods of Wednesday's game with a stomach illness, he did not start on Friday, but played in his 347th consecutive game.